I'm usually not much of a dessert person, but when it comes to a specialty dessert place like Afters Ice Cream, Creamistry, I just can't say no to trying. I'll always try it at least once and those fun reviews will come soon! A friend told me about Snow Monster and after Yelping it, I was intrigued! Snow Monster has two locations, one in Westminster and one in Huntington Beach. I’d opt for the Huntington Beach location because it’s not as crowded and still open late. 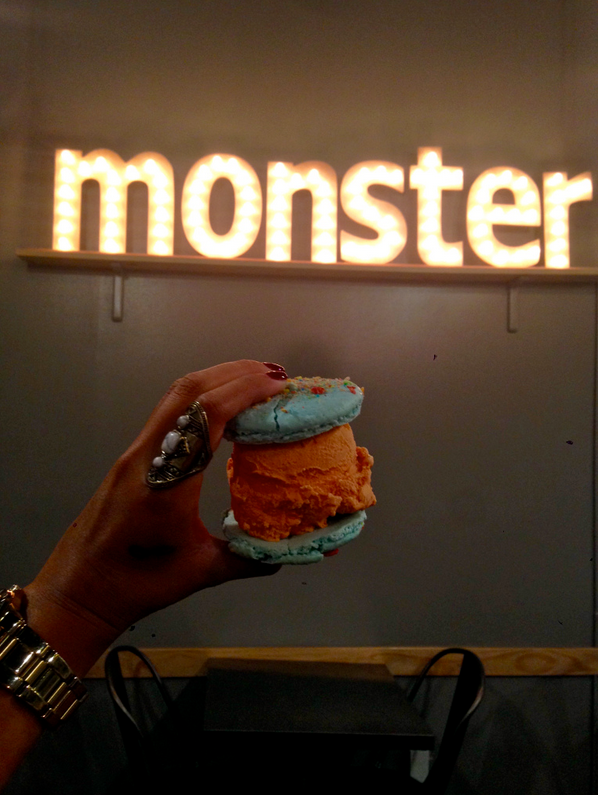 Snow Monster is known for its macaron ice cream sandwiches and its specialty hand-made ice cream flavors. Snow Monster's small yet extensive menu includes its popular macaron ice cream sandwiches, belgian waffle ice cream sandwiches/sundaes, cookie sandwiches and shaved snow with a variety of topping options. Another popular item on Snow Monster's menu is one of their "jar drinks." You have a choice of a Thai iced tea, jasmine milk tea and strawberry lemonade served in a cute mason jar adorned with its unique monster logo. I tasted the Thai tea ice cream and instantly fell in love! I went with a Fruity Pebble macaron with Thai tea ice cream sandwiched in the middle. My friend had the the Captain Crunch macaron with taro ice cream as the filling. It came out plated on a simple white plate equipped with a heat-activated color-changing spoon. I had to get one of their cute mason-jar drinks. It was too big to finish there, so I got a to-go cup that was adorned with its unique Snow Monster logo sticker.